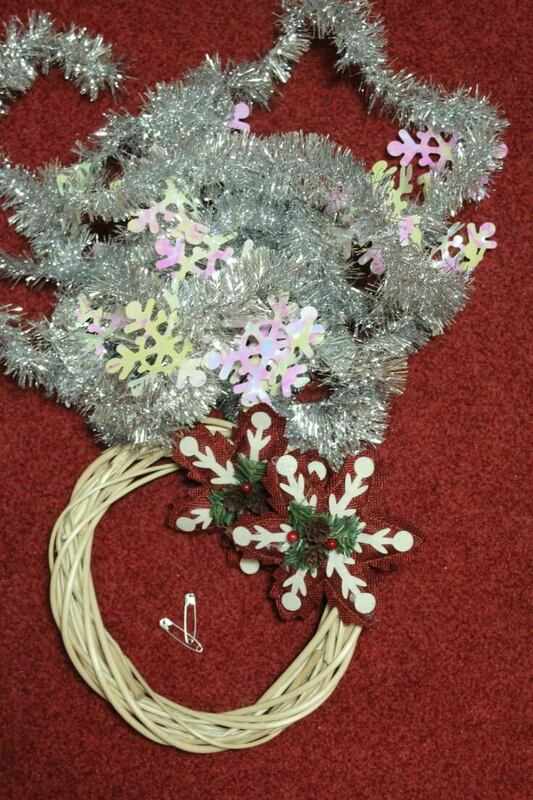 Get into the Christmas spirit with this 5 minute tinsel wreath made with tinsel garland! Simple but festive, this easy winter wreath requires just a few supplies and absolutely no glue! Can you believe it’s almost end of December? 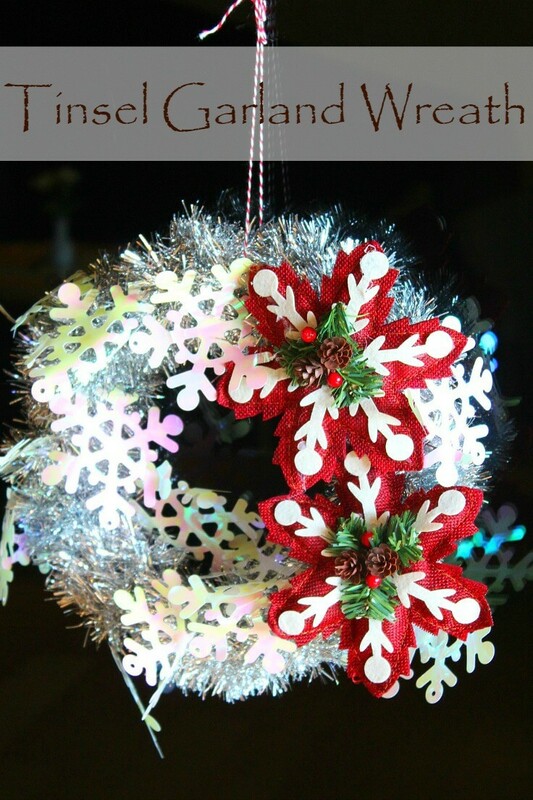 Christmas is just around the corner and I could not be more excited! And traveling on a cruise ship for the holidays makes things even more exciting and challenging. As you can imagine, I don’t have the freedom to decorate as much as I would back home. But I thought a little tinsel wreath would be a nice addition to the small space in our cabin, making the place more festive without overwhelming it. I love decorating for holidays and Christmas in particular is one of my most favorite holidays. When I’m home, I love to bake and craft Christmas stuff like it’s nobody’s business! But on a cruise ship, my creativity is very limited, simply because I don’t have the supplies or a designated space to create whatever my imagination wants. And also the ship is not my home, I can’t just play around with decorations. 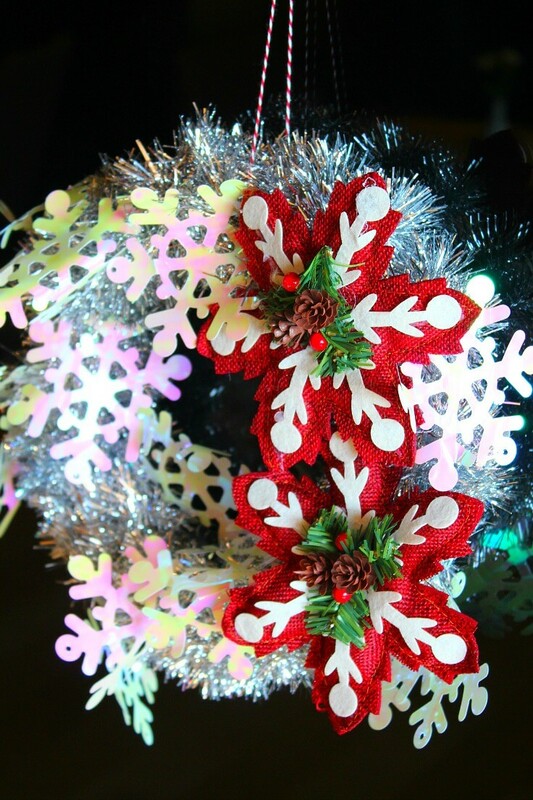 I have to limit myself to small stuff and this tinsel wreath DIY seemed like a great choice. Imagine this pretty, fluffy, shiny little tinsel wreath hanging at our otherwise sad door ( cause let’s face it, a hotel is not the most warm, intimate or cozy place on earth). And it’s so easy and simple to make! You only need a few things: tinsel, a willow wreath, a couple of safety pins and a couple of Christmasy decorations which are totally optional. 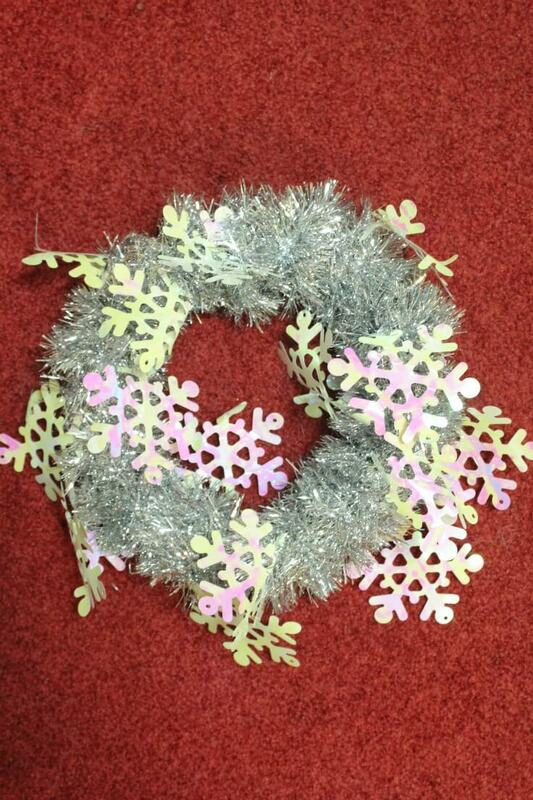 Your tinsel wreath would look just as great only with tinsel. Using a small willow wreath as a base for this tinsel wreath makes this craft cuper light and easy to hang anywhere in the house. 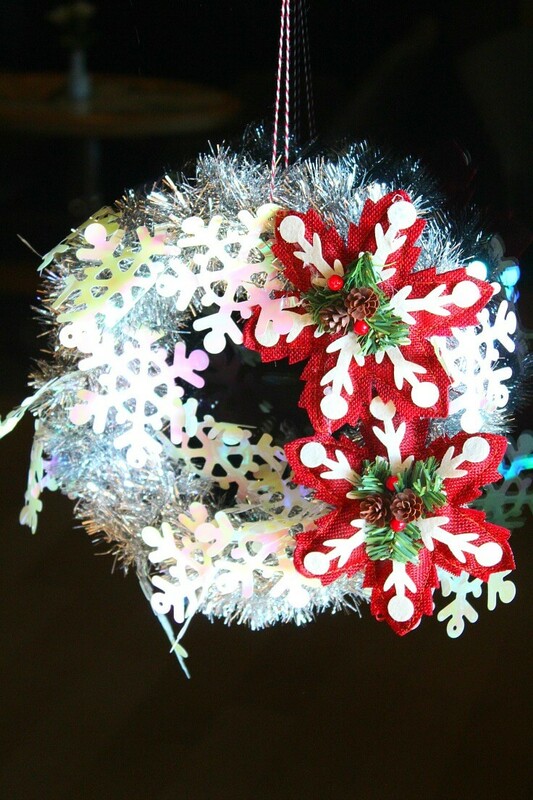 I like that this wreath doesn’t take up much space, making it perfect for small spaces but it brightens up any room instantly, thanks to its shiny colors and the cute snowflakes which are quite special, they reflect the light and change color; really cool feature! 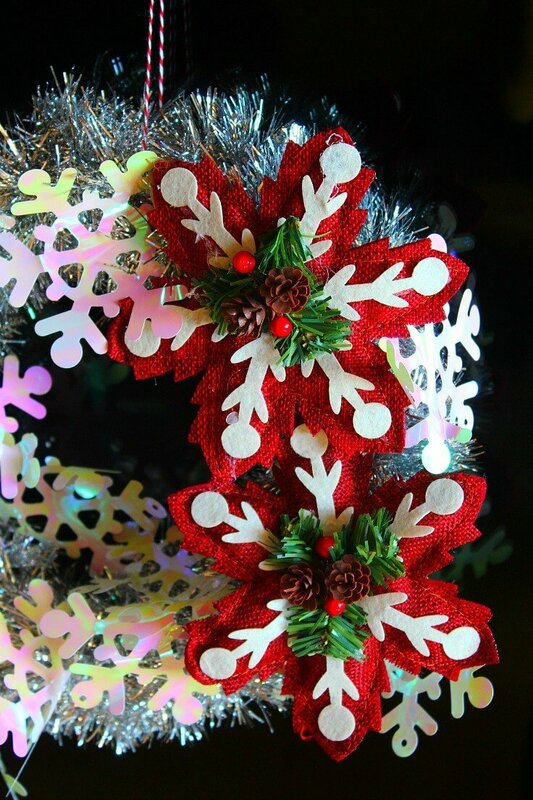 This lovely tinsel wreath also adds a little pop of color due to the red Christmas ornaments I chose to embellish my wreath with. Start by wrapping the tinsel around the willow wreath and secure at one end by twisting the tinsel around itself and kind of making a small knot. 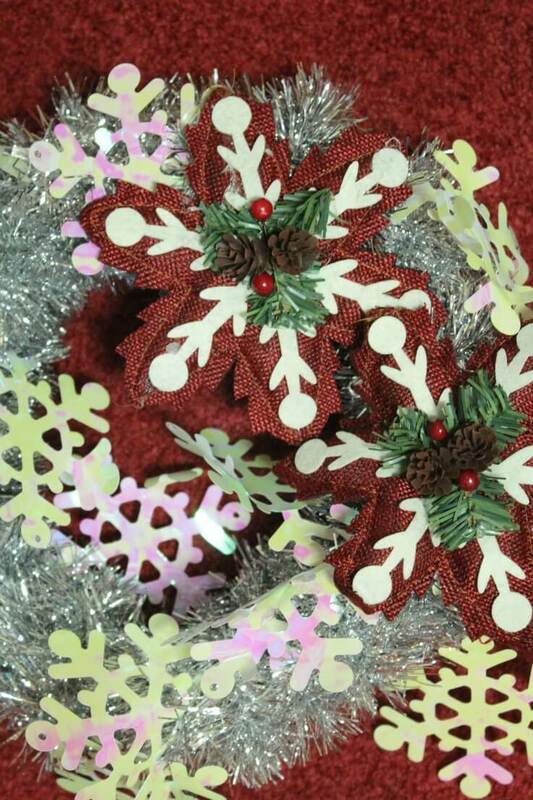 As you wrap the tinsel, make sure the snowflakes don’t get trapped but rather let them hang loose. When done wrapping the tinsel, secure the other end as before. Attach the Christmas ornaments with safety pins, on one side. Wrap some ribbon (or bakers twine as I did) at the top of your wreath and hang it anywhere in the house or at your front door.